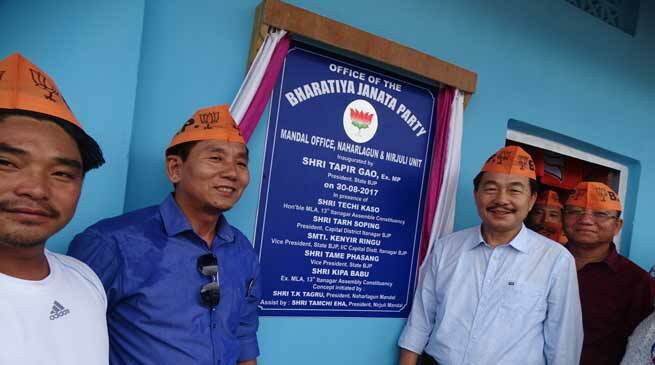 BJP state President Tapir Gao today appeal the party workers to be sincere and responsible toward their post and carry out works for development through party office. Gao while inaugurating the two mandal office at a place at Lekhi near Middle School exhorted the workers toward the responsibility given by the party higher authority. He said since BJP is a discipline party and one have to carry out their responsibility with discipline with dedication so that the outcome of the dedication is a part of development of state and country. Ill not complete until is is near and clean and hygiene and appeal the part cadres toward maintaining of swatch bharat abhyan every where, at school, college, office and at resident. Cleanness if the key for maintain a good health by which one can stay fit and fine. City BJP President Tarh Soping while highlighting some of the party activities in capital complex said that due to traffic cognisant and other issue there have been necessary to open a party office at a place at Lekhi wherein both Mandal unit of Naharlagun and Nirjuli have been accommodated and hope that workers may maintain sincere, discipline and dignity of the office.